How many times have you cringed as you discover your baby pooped out on his adorable little outfit? Or your toddler smeared raspberries all over his khaki shorts you were planning to use for family pictures next week? True story. I’ve been there countless times + sometimes even the thought of trying to get some stains out was enough to make me want to cry. I may be a little too attached to my baby’s clothes, but what can I say? They’re adorable + motherhood has made me all kinds of sentimental. From soaking clothes in the sink for days, to using bleach on all the white onesies, and even throwing them in the wash ASAP, nothing seemed to work well enough! And after 6 months of spraying + scrubbing + soaking his little clothes with every kind of soap, bleach, or stain spray imaginable, I finally found the magic! NOTE: Branch Basics is sold as a concentrate that you mix with distilled water in their pre-measured bottles to create different cleaning solutions. It sounds way more complicated than it is, you just fill up each spray bottle to the pre-measured lines with water + concentrate and you’re good to go! Spray stain liberally with Branch Basics All-Purpose spray, laying item flat and soaking the entire stain. Scoop Branch Basics Oxygen Boost over the stain, making sure to cover the entire stain. 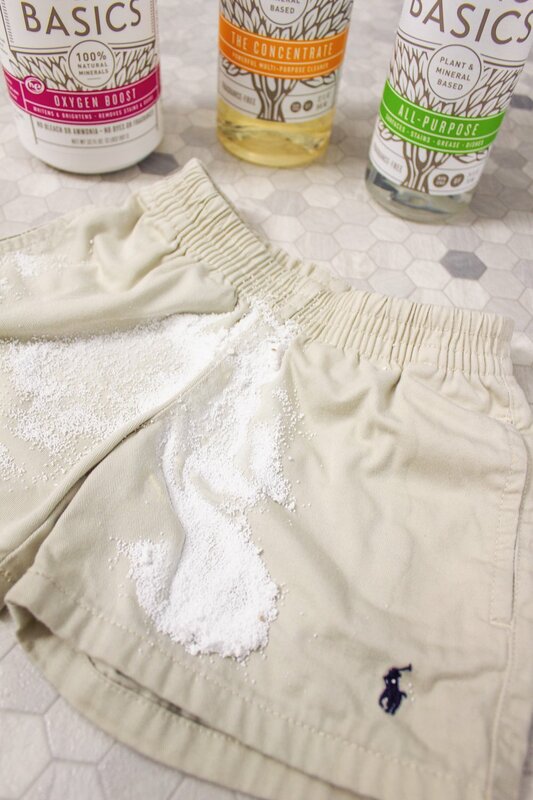 Agitate the stain by lightly rubbing it with a washcloth, activating the enzymatic reaction that takes place to lift + remove the stain. Spray stain liberally with Branch Basics All-Purpose spray again + let it sit overnight (or 6-8 hours). 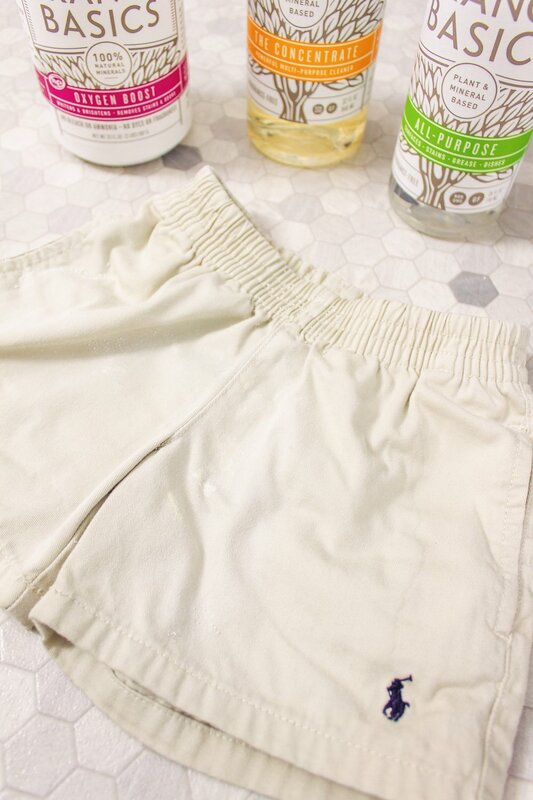 Brush off the Oxygen Boost to make sure the stain is fully gone + throw in the wash! There you have it, no more stains on those adorable baby clothes! Bright red raspberry stains all over his adorable khaki shorts. No more stain, not even the hint of a stain! PS As crazy as it sounds, this picture as taken before I even threw them in the wash! I just brushed off the Oxygen Boost + the stain was already gone! I like to use this Spray-Scoop-Agitate-Spray method on any stained clothes from that day after bath time + let them sit overnight. But you can also spray them first thing in the morning + throw in the wash 6-8 hours later! If you’re interested in trying Branch Basics, make sure to use this referral LINK to get $10 OFF your order! And feel free to leave a comment below with any questions!